“Tasting historically inspired dishes makes our shared story come alive and reminds us that Paterson’s rich heritage can be a foundation for a bright future,” said Giacomo “Jack” DeStefano, director of Paterson Museum, to diners, among them mayor Andre Sayegh and City Council president Maritza Davila. Destefano narrated the historic significance of each viand. Guests were treated to a four-course meal prepared by a 14-member team from the Culinary School at Eva’s Village. “The students were really looking forward to showing off their skills today,” said James Cwynar, director of the Culinary School at Eva’s Village. He described it as a “pop-up restaurant” experience – hungry patrons were seated at a long table with blue tablecloths, complete with silverware that was wrapped in elegant, cloth napkins. First came the Three Sisters Street Corn, the amuse-bouche, French for a small appetizer, featuring the main crops of corn beans, and squash, planted by ancient North Jersey inhabitants, the Lenape Indians. Guests were served a twist on traditional Mexican street corn with the incorporation of the three staples of the Lenape. An unusual, but tasty, popcorn drink was also served. Each offering included a different kind of beverage. The second course arrived on a picnic charcuterie board and featured flavors favored by European immigrants. Recreating the historical picnic of George Washington, Alexander Hamilton, and Marquis de Lafayette at the Great Falls in 1778, guests were served White House-made biscuits with local honey and beef. Honey, representing the ethic of hard work, was the logo of the Society for Establishing Useful Manufactures (SUM), an organization dedicated to promoting industrial development along the Passaic River during the early years of the republic, according to DeStefano. Third was the entrée, a submarine sandwich, featuring lamb Kofta served with house made bread, complete with various dips and spreads. DeStefano referenced the brilliance of John Philip Holland who developed the first submarine to be commissioned by the United States Navy, constructed in Paterson, in 1878. DeStefano said a Paterson shop owner named Domenico Conti, who owned a deli on Mill Street, saw Holland’s invention and was inspired to emulate the name for his meat and bread thus creating the submarine sandwich. Deniz Vergara, instructor at the school, explained the third course’s Middle Eastern connection. Kofta is popular in Middle Eastern countries. Today, Paterson has one of the largest Middle Eastern populations – whose dishes attract thousands to the Silk City — in the U.S. The spectacular dessert finale was prehnite crystal cake, a rum cake with green rock candy crystals. Prehnite is a pale green mineral that can be found in abundance in Paterson and Garret Mountain. Sayegh was impressed by the dishes. “This is awesome,” said the mayor upon tasting the historically inspired dishes. The students spent a great deal of time preparing for the “Flavor of the Falls.” Cwynar and culinary staff took a trip to the Paterson Museum to get a feel for the city’s history and culture. Students made sure every vegetable, meat, fruit, and dessert had links to Paterson’s glorious past. The school has two semesters every year. Students spend six hours a day, five days a week on becoming chefs. “Here at Eva’s we get two years of instruction in six months,” said student Terrence Frierson. Many of the students come out of the Eva’s recovery program and learn skills to become productive citizens. 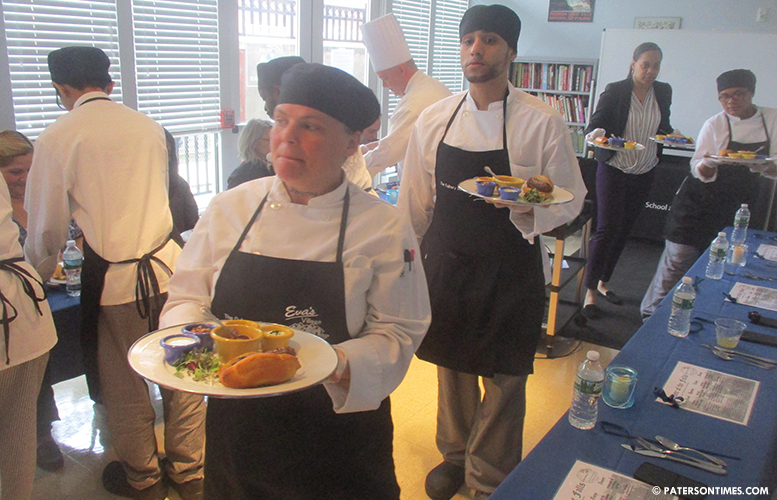 After four months of training, the aspiring culinary artists get internships at a local restaurants and bistros. The hands-on work experiences have taken place in such eateries as Rod’s Steak and Seafood Grille in Morristown, Viaggio Ristorante in Wayne, Twisted Elm in Elmwood Park, Batello in Jersey City, Osteria Crescendo in Westwood, Wayne’s North Jersey Country Club, Paterson’s Oasis-A Haven for Women and Children, and the Hackensack University Medical Center. Students also help prepare daily meals for over 300 people served at the Eva’s kitchen.